These are so delicious! 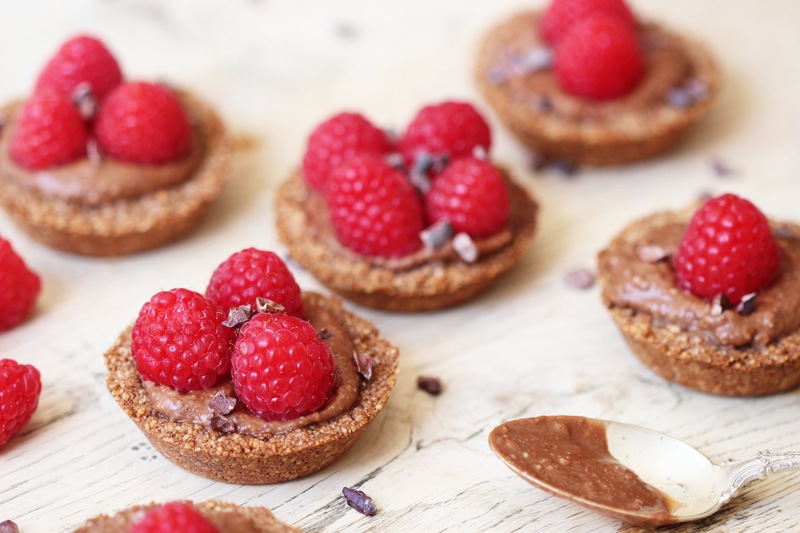 They’re surprisingly simple and they’re packed with healthy fats from the coconut cream and almonds and have a serious antioxidant boost from all the cacao powder in the crust and filling. 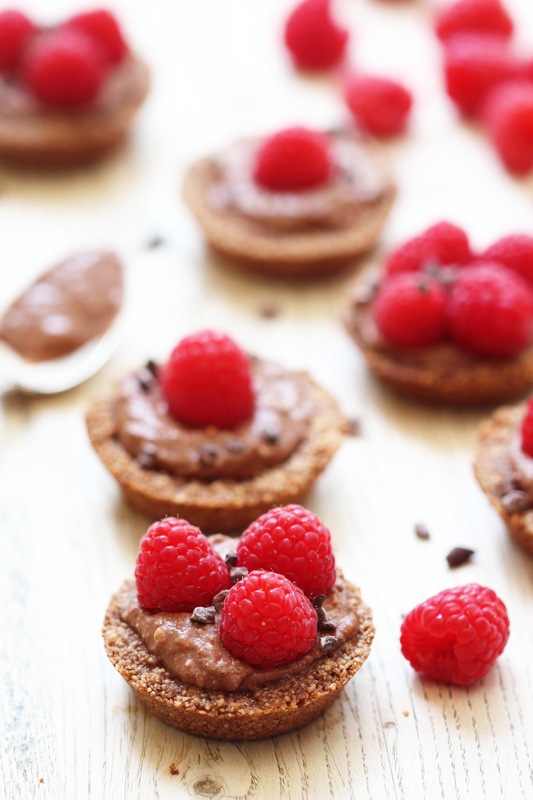 The bottom is my really simple crust recipe that doesn’t require any rolling or cutting and it goes gorgeously crumbly and crisp, then the middle is a silky coconut cream and cacao powder filling that tastes so amazing with the fresh raspberries. These are great if you’re having people over, I love giving each person a little individual dessert. You can make them a few hours in advance and pop them in the fridge until serving. Preheat the oven to 180°C. Take the can of coconut milk out of the fridge, setting it aside to soften a little. In your food processor, blend together the ground almonds, melted coconut oil, sweetener and salt and blend until you have a crumbly mixture. Line a cupcake tin with baking cases and press the mixture into the bottoms and sides of each one. Bake at 180’C for about 10 minutes until nice and crisp. Scoop the thick coconut cream from the top of the can of chilled coconut milk (keep the coconut water for something else) and add it to a large bowl. Add in the cacao powder and sweetener and whisk until smooth and whippy using an electric mixer. When the crusts have cooled, remove them from their cases. 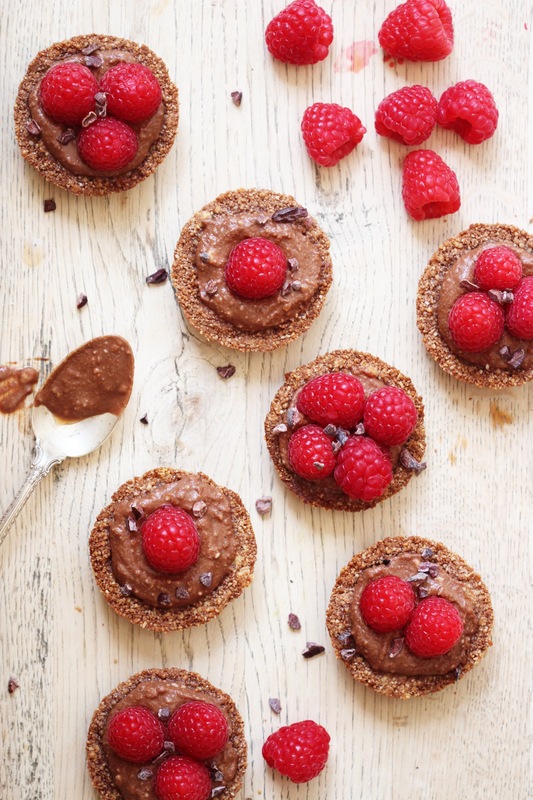 Fill each one with the chocolate filling and top with the raspberries. Serve right away or keep in the fridge for a few hours before serving. This crust sounds so yummy with the almonds and coconut oil. So easy and love that they are two bites! Cute! Can I make this on a Saturday for Sunday lunch?